There is one -- and only one -- moment of humanity in Zack Snyder’s Man of Steel (2013). It arrives near the very end of the over-long, over-stuffed film, and provides the blockbuster enterprise a final, long-missing, and much-needed quality of soul. Specifically, Clark Kent (Henry Cavill) relates to his Mom (Diane Lane) that he wishes his deceased dad could have seen him become the man he grew into. Ma Kent replies with earnestness that Kent does see, and then the film cuts to this incredibly tactile, incredibly human moment (from years earlier…) in which Jonathan Kent (Kevin Costner) is fixing his pick-up truck on the family farm while young Clark is nearby. Jonathan gazes up over the vehicle's hood to see his boy -- his young son -- playing at being a superhero in the nearby yard. Unobserved, the innocent boy plays his game with abandon, and here -- at long last -- we see, and sense, and truly feel some rush of genuine emotion: the love a father feels for his child; and a bit of the anxiety associated with that paternal love too. Encoded in this beautifully-shot grace note in Man of Steel is the idea that all fathers both love their sons and mourn their own mortality in relation to that powerful love. For -- because of the particular nature of our life-spans -- we can only catch glimpses of the future and shall not always know, in the end, what kind of men our sons will become. We can have confidence. We can have optimism. But we aren’t necessarily going to be physically present to see that boy’s final chapter of maturity. He will have our words and our lessons, and his memory of us to guide him in times of difficulty, but not our presence, not our reassurances. As much as we want to be there, we can’t stand with him in those last years. There's a deep pain associated with these facts, and this short sequence beautifully expresses that feeling of melancholy. Of simultaneous joy in the boy, and mourning for the time when we cannot be with him. This brief, lyrical scene in Man of Steel features no dialogue yet is visually powerful and more importantly, intimate on a breathtaking scale. The moment feels almost like a lost or forgotten memory, and is truly, uncompromisingly, superb. It embodies the reason I generally admire Zack Snyder's work as a director. He can craft images of real emotional power when given the opportunity, and the right script. I very much wish there were more moments like this one in Man of Steel. Instead, the film is dominated by action on such a ridiculously grand scale that you can't relate to it. And there is not one moment of this destruction, death, fire, rage, or combat that touches the human heart in the way that this single, elegiac sequence manages to do. Indeed, this small, human sequence pops up -- like some unwanted ghost or glitch in the machine -- in what is otherwise an incredibly generic, incredibly excessive demolition derby of cinematic destruction that lacks soul, humanity, humor, and most of all, hope. 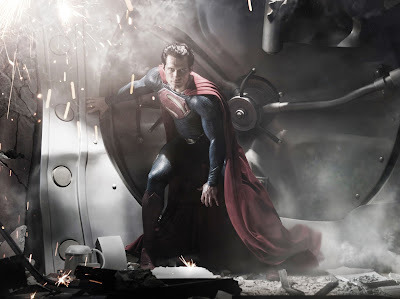 Make no mistake: this 2013 franchise film is actually embarrassed by the very name of its hero -- “Superman” -- and goes out of its way to eliminate or subvert long-enduring aspects of the franchise so as to somehow render its familiar origin story “new and fresh.” Much material, a lot of history -- and almost all humanity --are entirely sacrificed in this rush to make the Man of Steel seem “relevant” or "timely." Yet seeing the uninspiring results, this was a fool's errand. The audience never connects on a human scale with the titular character, or even the constantly-screaming, bulge-eyed villain. In short, The Man of Steel is a colossal, robotic, lumbering disappointment, a non-stop industrial machine that relentlessly extrudes destruction and despair as a substitute for entertainment and humanity. On distant Krypton, the great scientist Jor-El (Russell Crowe) warns the planet’s ruling council that the mining (or fracking?) of the planet's core has caused irreversible geological instability. In short, the planet will soon destroy itself, and the technologically-advanced culture it has long-nourished. Jor-El boasts a plan to save the planet’s genetic “codex” and restore the Kryptonian race on another world, but the Council rejects his idea. At the same time, General Zod (Michael Shannon) attempts a bloody coup. While pandemonium reigns on the planet, Jor-El and his wife Lara launch their new-born son Kal-El -- the first child born naturally on Krypton in generations -- towards Earth, where he shall live out his life. Following Zod’s banishment in the Phantom Zone, Krypton explodes, and Kal-El begins his new life on distant Earth. In Kansas, Kal-El (Henry Cavill) is raised by corn-fed farmers Jonathan Kent (Kevin Costner) and Martha Kent (Diane Lane). They raise him to hide his alien powers, fearing that the human race is not ready to accept an alien in its midst. After graduating from high school, Kal-El holds down lonely, odd jobs, and seeks some clues as to his alien nature. He gets one in the Arctic, where a Kryptonian spaceship -- buried in the ice for 18,000 years -- is discovered. Using a command key from his own spaceship (which remains stored in the Kent homestead’s barn...) Kal-El activates the systems on the scout ship, and meets a hologram image of his father, Jor-El. Jor-El provides him a special Kryptonian suit to wear, and informs him that he is now a child of two worlds. Unfortunately, the command-key has also sent out a homing signal, one which General Zod and his fanatical, militaristic followers are able to trace back to defenseless Earth. Even as a reporter, Lois Lane (Amy Adams) begins to track down the mystery of Clark Kent, Zod and his forces approach Earth with the agenda of finding the genetic codex, establishing a new Krypton, and wiping out (or at least enslaving…) the human race. Sometimes, I wonder if the ubiquitous “geek” or “fan” culture has been done a grave disservice by the Internet, where its loudest (and sometimes most radical...) members declare what they want, desire and demand out of Hollywood adaptations of favorite properties. 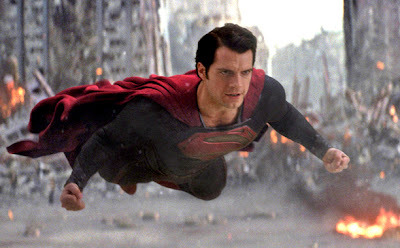 Bryan Singer's Superman Returns (2006), for instance, was met with widespread fan scorn because it was, overall, a human-scaled story, featuring a human villain, and a sensitive hero. It resolutely did not feature the world-shattering, city-destroying action that some fans of Superman, apparently, desired. The fans want super villains and super-battles! Well, the overall message of Man of Steel must certainly be a cautionary one: Be careful what you wish for, because you just might get it. With this proverb in mind, Man of Steel is an endless, tiring -- nay numbing -- paean to falling skyscrapers, vehicles tossed into the sky, and super-powered people throwing each other into the air at near warp-velocities. The rampant destruction continues for such a long time in the film -- and is so colossal in scope -- that, in the end, not a single action scene actually packs much of a psychic punch, or has the tiniest emotional impact. The makers of this film never heard that less can be more, apparently. And their choice to make the third act of Man of Steel all-action-all-the-time consumes precious moments (or hours?) that would have been better spent establishing the characters and their lives. This is an optimistic opinion, for there are precisely four people left standing and visible in the frame: Perry White, the intern, another Daily Planet reporter, and Lois. Meanwhile, the city smolders, and the landscape appears positively post-apocalyptic. The "he saved us!" line actually elicited laughs in the theater from other patrons because the staging -- and the overt, monumental destruction --suggests that Superman hasn't really “saved” much at all. Of course, we must assume there are other survivors beyond these four, but Metropolis now looks like the victim of 1,000 9/11 attacks, and a hundred super-storm Sandi-type incidents. I half-expected to see in the background some graffiti that read: "Roland Emmerich was here." Despite the fact of rampant destruction, the screenplay does not provide a single line -- not one word -- about the herculean task of re-building the city, which now looms. Indeed, the film ends with Clark Kent merrily taking his place at the Daily Planet, which looks clean and orderly...as if nothing ever happened. Perhaps Superman could help with the efforts, but again, the film might make note of that fact. Given what our lying eyes show in Man of Steel, it would be years -- perhaps decades -- before anybody was even going to work in Metropolis again, or frequenting the Daily Planet building. The entirety of Man of Steel’s last act is filled with oversights of this dramatic and clumsy nature. As I noted above, the plan to get rid of Zod involves creating a singularity -- a black hole, essentially -- just a couple of hundred feet over downtown Metropolis. Fair is fair: I complained in my review of Star Trek (2009) when a singularity was opened in the Earth's solar system, but the proximity of the singularity here to a major city is much more egregious, and much more dangerous. And again, the film never includes even a single line of dialogue to suggest how the singularity is to be closed. All that is discussed, if memory serves, is the connecting of two phantom drives to create the black hole in the first place. Still, you’d think that “opening a singularity” would require, as well, an exit strategy. Also, in one of the film’s more far-fetched moments, Lois Lane falls away from the opened singularity, even as material is being sucked up from the ground, towards it. So...she weighs more than a car? Or a huge chunk of asphalt? This isn’t just bad writing...it’s Superman IV: The Quest for Peace (1987) bad writing. But because the special effects are so good, no one comments much on the gaps in situation logic. I’ve written about blockbusters of this type before, and it saddens me to see the Superman franchise to succumb to this sad trend. In short, this movie all about pummeling the audience with destruction, with special effects depicting massive carnage. Incident piles upon incident and the writers clearly hope that the viewer will be so throttled, so overwhelmed, that he won’t notice that there’s no plan to close the singularity opened over Metropolis proper. Or that the very idea of opening up a black hole over a city is really, really reckless..
Or that Superman “saving” Metropolis actually ends up being the greatest loss of human life and treasure since the bombing of Hiroshima or Nagasaki. My point is not that the movie can’t feature rampant "super" destruction; but that it shouldn’t feature such destruction, and then turn around to end the movie, moments later, with Clark happily joining the Daily Planet staff. The latter scene boasts no credibility if this much destruction actually occurred. Cities can be easily destroyed and re-built with CGI effects, but real life is much more problematic in this regard. Man of Steel possesses no sense of verisimilitude at all. It's just explosive eye-candy, with frayed connective tissue occupying the small spaces between action scenes. The same problem of clumsiness recurs with the depiction of the Kryptonians. One of Zod’s underlings informs Superman that he is crippled by morality, but that she is not. This is a throwaway line, but it causes all kinds of problems. Are all Kryptonians sociopaths by nature? Has Clark escaped that fate because of his human upbringing? Or does the line about possessing no morality apply only to genetically engineered soldiers? Again, the problem here is follow-through: the line has no explanation, and therefore nothing beyond a momentary resonance. It means nothing in the scheme of things, and raises questions that needn't be raised. The desire and willingness to bury Man of Steel in special effects sequences also leads to other bad creative decisions in terms of storytelling. In many depictions of the Superman origin story, Jonathan Kent dies of a heart attack (think Superman: The Movie  or even Smallville [2001 – 2011]). Here, he literally gets sucked up into a Category Five Tornado that is spitting out cars and other debris with typical CGI efficiency. In the desire to “throttle” the audience, the movie-makers thus skip one of the most critical life lessons for Clark Kent: that there are some things, and some deaths, that he can’t avert. Even as Superman, he can’t control everything. Clark can’t save his father because he is not master over all life and all death. Being "super" doesn't mean being God. This simple human truth is Clark's most important connection to humanity on Earth. Ultimately, no matter our planet of origin, we are all the same when it comes to dealing with the mortality of our loved ones. By replacing a heart attack with a scene-stealing tornado -- that Clark can stop, but doesn’t -- the film misses this key moment in Kent’s maturation process, A human scene has been replaced with spectacle, and the spectacle, ultimately, has no point. What precisely was the lesson learned here? As the state-of-the-art special effects so adroitly dramatize at other junctures in the drama, Clark can move so rapidly that he could have picked his father up in a blur, rescued him, and not revealed himself to anyone. The Kent death scene in Man of Steel carries no psychic weight as drama, because Jonathan's death is arbitrary. It's just another opportunity for good effects work, not for character growth. I wrote about this a little in my introduction, but it seems to me that the whole “re-imagining” of the Superman legend as seen in Man of Steel originates from a point of vast insecurity and embarrassment about the character. First, the film tries to (over)compensate for the perceived failings of Superman Returns by featuring city-shattering action by the boatload, instead of actual human interaction. Secondly, it won’t even let characters say the word “superman” without making it a joke, as if the Man of Steel’s superhero name is any cornier or cheesier, intrinsically, than Batman, Spider-Man, Iron Man, or Hulk. Thirdly, the film skips the whole concept that Lois Lane does not know that Clark and Superman are one in the same. Why? Well, it’s a defensive and insecure posture too: how could anyone believe that mere eye- glasses could hide a person’s identity...especially from a Pulitzer Prize-winning author? Indeed, that's another dramatic point and theme of the Superman myth. Supermen hide among us all the time: everyday heroes whom we might dismiss as a nerd or klutz, but who -- in a moment of crisis -- rise to the occasion. We dismiss them, on a regular basis, as ordinary Joes. This huge change in tradition will have serious ripple effects in the movie franchise. Now Lois boasts no defining struggle as a character, no hurdle to overcome. She can’t even be jealous of or competitive about Clark’s journalistic skills, because she knows she would be competing, essentially, with Superman. And that would be foolish, wouldn't it? Of course, iterations of the myth, across the long years, have reached the point where Lois knows the truth about Clark Kent. But that knowledge is almost universally hard-won. Here it is the starting point, and thus there is no sense of character conflict between Clark and Lois. This Lois is even -- gasp -- warm-hearted and soft. She decides not to pursue Clark’s story after meeting him, when he convinces her (in one brief conversation...) that he should be left alone. Again, she doesn't know him at this juncture...at all. So why go all wobbly? Because he's "kinda hot," in the film's vernacular? In 2013 -- especially with all the battles about the role of the press in security and privacy -- to feature a Lois Lane who is so weak virtually qualifies as writing malpractice. The Man of Steel does feature a character called "Woodburn" (an amalgamation of "Woodward" and "Bernstein"), but it the truth is that the movie has approximately zero curiosity in the ideals of journalism (free speech, etc) which have been a key component of the Superman mythos for decades. Finally, I find it spectacularly lacking in creativity and imagination that Man of Steel ends with Superman breaking Zod’s neck, rather than finding a way to neuter him, banish him, or otherwise defeat him. I can’t fathom how Superman can be said -- in this film -- to be a figure of “hope” when he pulverizes half of Metropolis (and Smallville too) with his own hands, and then, for his last act, commits murder. People wouldn't be inspired by this Superman. They'd be terrified of him. The merits of Zod's murder can be debated, of course, given the specifics. There was a human family to rescue, and Zod clearly wasn’t going to stop fighting, no matter what. Essentially, he picked suicide by Superman as his manner of death. Yet virtually by definition, being “Superman” means finding good, creative, meaningful alternatives to murder in times of crisis, pain, and suffering. On top of all the excessive carnage highlighted in the film, the murder of Zod simply confirms the film’s ugly, dark, misunderstanding of a great American icon. What Man of Steel profoundly misses is that Superman is designed to be symbol of all that is good in America, and all that is right. He represents a romantic but worthwhile ideal (truth, justice and the American way...), and is supposed to be a role model for children and adults alike. To have him in his first re-booted adventure pulp a city, a small town, and mete out death to his enemy with his bare hands, suggests the kind of “reboot” of a beloved character I simply can’t get behind. Star Trek Into Darkness handled this idea far better. You aren't a hero at all when you descend to your enemy's level of barbarism. Instead a man -- especially a superman -- must take the hard route and be better than his enemies. He must be smarter, more creative, and more merciful. But the shadow of the Dark Knight is a considerable one, and these days, all superheroes most be tortured, dark ones apparently, even beacons of hope like Superman. Man of Steel might more accurately titled Heart of Steel, because no light, no love, no humor, no soul is allowed -- except for one brief interlude -- to shine its light in the film. The result is a movie that is both computerized (in terms of effects) and robotic (in terms of story and character). So, if you want to believe a man can fly -- and that a movie can soar -- check out Superman: The Movie. If you want to see skyscrapers collapse, jets hit the ground and explode, trains fly through the air and then land on people, and super-strong people punching each other at high-speed velocities, this is the Superman interpretation you've been waiting for. Everything you said, except I was not moved by the one scene you praised. I thought it too little, too late, too random and just plain too shallow. There are a few other fleeting moments like that: Superman drowning in a pile of human skulls could have been the Sarah Connor/T2 nightmare scene of this film, then countered with some truly uplifting comeback of a climax. But nay. It came and went ...nowhere, fast. And was ruined with Zod's monologue. In fact, the whole movie can be summed up as: exposition, monoluge, exposition, monologue, exposition, monologue, obnoxious shaky came, insipid naval gazing, exposition, monologue, washed-out color schemes, monotone line deliveries and/or constant bad guy shouting, exposition, monologue ...followed by 40 minutes of real estate carnage. Hooray. John, if you want to see an FX driven spectacle with a lasting sense of imagination and high-spirited, old fashioned heroism, check out Del Toro's geek love letter to Cthulhu myth, Godzilla and various anime with Pacific Rim. It's actually, ya know, fun. I really, really want to see Pacific Rim, Cannon. I'm looking forward to it. Man of Steel is a colossal disappointment, I think your summation of it is spot-on. I haven't disliked a movie this much in a while. I'm sorry to say, but I have to agree, John. Snyder went for the blunt force trauma approach with MAN OF STEEL. I have not seen such a cowardly film in quite some time. It's as if the "failure" of Superman Returns (2006), inspired the creators of this film to throw out everything good and decent about that film (and the character of Superman), and then pander to the crassest, most violent desires of the mass audience. Truly shameful. To quote Roger Ebert: "I hated, hated, hated, hated this movie." I'd been eagerly awaiting this review to read what you made of "Man of Steel", John, and - of course - you did not disappoint! That overload of action and destruction was one of my key complaints, too, as someone who also very much appreciated the largely overlooked merits of "Superman Returns". I think I understand that we were meant to feel that Superman had no option than to kill Zod, but perhaps it just wasn't sold to us convincingly enough. Certainly, heralding the end of all the action that preceded it, it was at least a moment that engaged me in terms of the tension it created, and in its momentary focus upon a tiny part of the human cost to that climactic battle. For me, most of the movie's best and most affecting scenes featured Kevin Costner's Jonathan Kent - including the scene you highlight. Costner is an actor/director I have long admired (although I know he has his many detractors) and for me the bulk of the heart that the movie did allow itself were exuded from his scenes. I didn't have as much of a problem with the manner of his death as many others did either; I *believed* the scene on first viewing, anyway, although I do understand your objection. 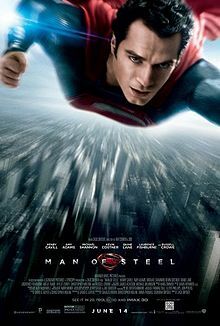 My hope is that the sequel to "Man of Steel" will reign in the action, and ratchet up the heart and soul of Superman. As much as I loved Brandon Routh, for me Henry Cavill was great with the material he was handed. I think a more balanced, nuanced and restrained sequel may yet prove a real triumph. You make an observation I wish I had included in my review: what humanity exists in the film is largely due to Kevin Costner's performance and screen presence. He was a high-point of the movie for me, and his work struck just the right note, I agree. I hope that the inevitable sequel to Man of Steel finds some way to augment not the destruction, but the humanity of Superman. John, your Man Of Steel review is absolutely accurate. Your thoughts of father and son issues is brilliant. It is sad to say that the Superman franchise has gone down a narrative path that has little emotional impact. The mass chaos of CG destruction can not ever replace the human element of emotional scenes displaying character development in any film. Thank you so much. I agree with your comment completely. The violence here is so pervasive and over-the-top that there is no sense of humanity. This is a CG violence fest, and not Superman at his most uplifting and inspiring. While I agree with a substantial portion of this review, I cannot agree with the assessment of Lois Lane. Too often I see people talking about Lois Lane as if her harsh edges represent a full understanding of the character. The reality is that the character is extremely complex...much more complex than people give her credit for. Lois Lane is a seeker of truth but she is not a seeker of truth at any cost. The cost, for Lois Lane, is whether revealing the truth would be for the greater good. In this film, after tracking Clark all over the world and learning the way he had essentially spend years helping people, Lois Lane decided that exposing him was worth less to the greater good than protecting her source. That does not make her soft or weak. It makes her Lois Lane. It's why she's a heroine in her own right---because she is able to discern what is the greater good and balance that with her own interests. That's the DIFFERENCE between Lois Lane and some of our modern figures in media. She has a heart. She has a soul. Her goal is truth and justice....not to expose or hurt the innocent. And that has ALWAYS been true about the character. It's why she is always so taken with Superman because he is one of the few things that stands up to her scrutiny. As for the Triangle For 2 being absent from this film: Again,I can't agree that there is no source of conflict or growth for Lois going forward. And I think it's dangerous to imply that this is where Lois needed to find her conflict. The Triangle For 2 can be a beautiful, wonderful thing. Personally, I thought Smallville's Triangle for 2 was absolutely brilliant. One of the best things they did on that show. But the Triangle for 2 is also NOT something that vanishes just because Lois Lane knows that Clark and Superman are one in the same. On the contrary, good writers know and understand that Superman's dual identity as both man and hero and how both of these personas love Lois Lane and how SHE loves both personas in return is a piece of the narrative that transends "the reveal" and is a vital piece of the narrative well into even their marriage. Lois's conflict cannot and should not be not knowing the truth about Clark. That's a narrative choice rooted in misogyny that places the burden on Lois to "see" as opposed to placing the equal burden on both of them to be honest about how they feel and to work together. I see plenty of conflict ahead of Superman and Lois in the potential sequel that is worth exploring with the secret out in the open. Clark has been running from place to place for years now. Can he actually accept that he has a place now in humanity next to Lois? Or is he going to struggle with this? Will Lois view herself as a burden to him? How will she balance her intense drive in her career with the reality that now the biggest story of the century is sitting right next to her? Can Clark accept that he cannot control this woman---no matter the powers he has---and that he has to let her live her life without his constant protection and interference? What we saw in Man of Steel was a connection between two people who both saw good and potential in each other and took a leap of faith on each other. There is absolutely humanity in that. Lois saw that Clark was trying to help and she protected him bc it was the right thing to do. Clark saw that Lois was willing to protect him and it made him realize the bravery that existed in humanity. But we have a long way to go before we explore the full extent of the relationship between these two people and the conflict and growth between them is not over simply because Lois knows who he is. On the contrary, there are new ways to explore the dual identity of Superman here if a writer has the patience and creativity to do it. Thank you for a detailed, thoughtful comment, Anonymous, and for an interesting perspective on Lois Lane. However, the problem is clearly as I state it in a review. Why would Lois Lane -- a smart, aggressive reporter who understands journalistic integrity and responsibilities -- agree after meeting Clark once, not to tell his story to the world? I agree that she could come to that decision/conclusion after some time, but it happens far too fast in Man of Steel. There is no real character motivation for her to do it. If she had a history of acting this way, she never would have been hired by the Daily Planet. It would be like Sam Donaldson deciding not to cover Iran/Contra because he liked Ronald Reagan. Part of journalistic integrity is indeed balancing the need of the public to "know" and the need of the individual (like Clark) for privacy. Lois has no conflict on screen in the film. She just arbitrarily decides in favor of Clark. Also, the fact that Lois Lane is immediately taken by the Kryptonians and held captive with Superman explains the dramatic purpose for the long-standing Clark/Superman/Lois triangle. If Lois knows too much, she becomes the first target of the bad guys. We see that exact scenario play out here. She is taken captive, and put in terrible danger. I enjoyed reading your comment, but to suggest thate there is misogyny involved because Lois doesn't know that Clark is Superman is a bit of exaggeration. You know who else doesn't know that Clark is Superman? Jimmy. And Perry White. And the rest of the world's population (save for Ma and Pa Kent). So it's not like this is something designed to make Lois look stupid. I think my review explains the point: we sometimes don't see what is plainly in front of our face. Thanks for a thoughtful comment, and please, next time, leave your name, so I know who I'm conversing with. My nephews loved it. He protected his mom. He saved lives. He discovered the joys of flight. This is their Superman and they will be just fine with it. Grownups forget what it was like to be a kid and watch Superman II with all its destruction. All we saw as kids was a damn cool fight. In other words, my nephews are learning what grownups forgot. Thanks for your comment, but I do respectfully disagree with your view point. Superman II featured humor effectively throughout so as to leaven the terror of violence and the villains, and -- let's face it -- the violence there was on a much less colossal scale than the violence featured in Man of Steel. The violence here is also much more personal: Superman snapping Zod's neck on screen. It's brutal. We all must make the choice for ourselves, of course, but I wouldn't let my son see this movie. It's a very hard PG-13 in my opinion. And come on, grownups have forgotten no such thing. I loved Star Trek: Into Darkness this summer, which was a lot of fun without being brutal and featuring carnage candy. So I love fun and exciting movies as much as the next person. But Man of Steel is gloomy, dreadful overkill. So we can't hide behind the "kids are so much wiser" than adults argument here. Your view of that one lyrical scene in Man of Steel, young Clark playing at superhero, rang, to me, shallow and manipulative. First of all Clark is playing at being a superhero who does not yet exist. It could be argued there are costumed heroes in this world, or that Clark somehow "knew" who he was going to become - but it's a scene that plays on what the audience knows about Superman (the iconic comic book HERO Superman) NOT the Superman as seen in Man of Steel. But I feel the real emptiness of the scene is shown in Jonathan seeing Clark as the costumed character he will become, not the man he could have been. The real heroic scene is when young Clark saves a school bus full of children. That scene shows a caring hero. Instead of a loving father having a conversation with his son the hero is shamed into hiding his secret. Even to the ridiculous point of watching his own father die when there were several ways to save him without discovery. Is it any wonder Superman has such disregard for humanity when battling super-villains? He has no connection to us because his own earthly father taught him we're not worth saving. I can only view such failings in character as the fault of the writer(s) and director of the movie. It doesn't give me hope that the sequel will be any better. Another fascinating perspective, and I can see your view-point. I identify with the scene as a father, now doubt. Someone who simply catches his son in the act of being a kid, and who, in that un-reflective moment -- sees the potential for happiness, greatness, what-have-you. I can't argue that it isn't manipulative. But unlike the rest of the film, this sequence is brief, without terrible dialogue, and visually adroit. It says something succinctly about father and son with imagery. That's as good, in my opinion, as Man of Steel ever gets. The rest of the film is clunky exposition, and carnage on an inhuman, excessive scale. Perhaps I liked that scene so much because, flawed it or not, it was the only one that played as remotely human or soulful to me. 'Relevant' and 'timely' are the antithesis of 'classic' and 'timeless'. I don't mind anonymous comments, but I will always ask that readers leave a name, just so I know who I am conversing with. Part of the fun of blogging is getting to know different folks. But I agree COMPLETELY with your blunt and spot-on commentary. Well, once again, you've nailed it, John. This movie is unquestionably the biggest disappointment of 2013 (and maybe the teens, period) so far. If there's one thing Superman should never be it's cynical. And this movie oozes cynicism and hopelessness from its every pore. Is this what the filmmakers truly thing audiences want? Where's the humor and -- dammit -- HOPE? At a time in history when we could really use a character like Superman, who used to represent hope and charity and justice and optimism, and to have him twisted into yet ANOTHER corrupt and degenerate symbol of post-9/11 anxiety and fear -- Why? Clearly it's not the audiences who are demanding these "Dark Knights." Witness IRON MAN or CAPTAIN AMERICA or THE AVENGERS; movies filled with positivity and humor that have done ridiculous, land-offish business. Why why WHY would you take the most optimistic comic book hero ever created and turn him into Debbie Downer Destroys the World? We love Batman because he's Batman and the films were true to his character's dark essential nature. They didn't try to turn him into a beacon for Truth, Justice and the American Way. So why doesn't Superman get the same consideration? So, you know what? Screw this "Super"-man. He's an imposter. The real Superman would never countenance, much less accept, collateral damage as an acceptable concept. The real Superman would have found a way to keep those buildings standing and those innocent civilians ALIVE. And he would never, EVER kill an enemy if there were any other option whatsoever. He would have found a way. The whole point of Superman is that he would always find a better way. A way to BE "what's best in all of us." Decent writers with a modicum of conscience would have found a way to not betray the character, to not surrender to nihilism. To give us what we NEED right now instead of more death and darkness. May I add an "amen" to your comment? Because brother...amen! "At a time in history when we could really use a character like Superman, who used to represent hope and charity and justice and optimism, and to have him twisted into yet ANOTHER corrupt and degenerate symbol of post-9/11 anxiety and fear -- Why?" I've had this kind of reaction to a lot of movies over the last several years. I just keep thinking "Is this really what people are looking for? More thoughtless destruction and sensation for its own sake?" I was even taken aback at the "Kahn kinda wins/destroying San Francisco Bay" ending of the latest STAR TREK (a movie I really liked). It just seemed like a gratuitous and excessively ugly slap in a film that was otherwise about much, much finer things. All I could think was "good God -- how many thousands just died? And for what?" "Why why WHY would you take the most optimistic comic book hero ever created and turn him into Debbie Downer Destroys the World?" LOL! I swear I even heard that trombone at least nine times during the movie. First of all, I just want to say, fantastic review. I've been looking forward to reading your thoughts on Man of Steel ever since "Superman Week," and it was definitely worth the wait. What a disappointing take on a classic character. It is, ultimately, the writing that fails him. As you alluded, if only they would have spent a fraction of the time, money, and effort that went into the effects on crafting a better story. Meanwhile, this thing is out there bringing in the money, which unfortunately may only guarantee more of the same in future installments. The young Clark pretending to be a superhero scene was certainly moving to me in that it reminded me of doing similar things in my childhood. However, it also left me thinking, who are today's kids going to imitate? This version of Superman? Sadly, they shouldn't even see this movie. John, I definitely agree with much of what you say, but, like j above, also was bothered by the scene of young Clark playing super-hero in a world that has never known super-heroes before. Who is he supposed to be playing as? And, I thought the same as you did while watching Jonathan's death scene. Aside from the fact that Clark could have sprinted to the car to rescue the dog himself, without using obvious super-speed, he could definitely have whisked Jonathan away before the tornado got him. Regarding the lack of hope, I said the same thing in our review on Destinies. If Superman is supposed to represent hope, why is he costumed so darkly? The primary colors of the comic book and previous cinematic Superman incarnations have always been meant to inspire. This dark blue-grey version, in addition to being visually dull, does nothing to inspire anything. And, I also, felt, as you did, that the filmmakers were embarrassed by the name Superman. You can see that in the scene where when the name is about to be uttered for the first time, it is cut off in mid-word. And, when he is finally called Superman, it is only by two soldiers, discussing him incredulously, in the third person. As far as him killing Zod, though, sadly, there is a comic book precedent for it. 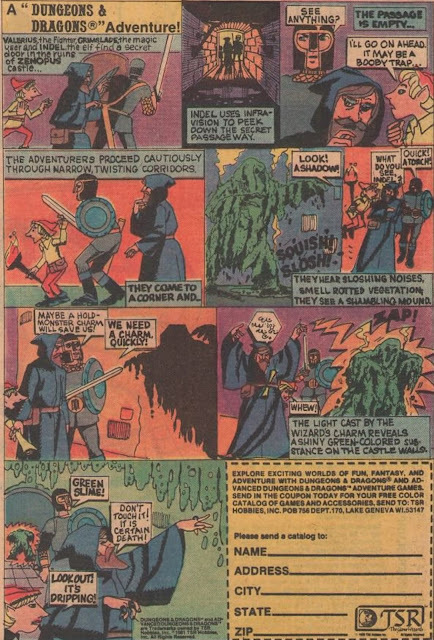 In Superman (2nd series) #22, John Byrne had Superman execute three Phantom Zone villains even though they were powerless, and locked in a bunker on an airless Earth in a pocket universe, simply because Zod threatened to somehow, someday, escape imprisonment, regain their powers, and make their way back to Superman's world to destroy it. Instead of shrugging off what amounted to an empty threat, Superman opened a box of green kryptonite, and killed them. While Man of Steel's Zod-execution was also annoying to those of us who believe that Superman should always find a way to preserve life, at least this time, he was in more of a crisis situation. That last sentence actually reminds me of the part I found most distressing about this film. With all of the destruction occurring during the super-battles, there had to be a huge loss of human life. It's very unlikely that everyone escaped from every building before it fell, not to mention anyone who might have been at that gas station in Smallville before it turned into a massive fireball. A far cry from Christopher Reeve crying out "The People!" before Ursa and Non threw him under the bus, as it were, in Superman II, and Ursa pointing out that he cares for these Earthlings. I'm surprised that you didn't mention how Hans Zimmer, in deliberately avoiding the use of John Williams' iconic theme, only succeeded in creating a totally unmemorable, if serviceable score. I agree with everything you wrote and I am glad you mentioned the score. There is not one moment from that score that I can call up now, a week later. It's gone into the ether. Totally, totally undistinguished. I didn't mention it because I was already over 2,500 words, and I felt I had made my major points about the film. As you know, I hate, hate, hate, writing negative reviews. I hate spending time on them. I'd much rather write an appreciation than a condemnation. You spend most of it criticizing the last 30 mins of a 140 mins long movie, but what about all the beautiful scenes/themes that come before the admittedly overblown battle? The wonderful opening on Krypton, the various touching flashbacks, the good acting of Cavill, Adams, Crowe, Lane and Shannon etc. You ignore it all and endlessly repeat that there are too many explosions, at the same time saying you liked the last Star Trek trash that really is endless explosions and nothing else! Whatever happened to the deep analysis on themes and characters you usually post here? Ending the "review" with a notalgic ode to Donner's movie is also quite sad. The 1978 is still one of the best comic book films ever, but it's also quite dated (and I don't mean the special effects) and often silly, definitely NOT the best way to adapt a major character like Superman for the screen. To quote Erbert: "I hated, hated, hated this review"
Andrew:"(By the way, Superman killed Zod in the sequel too, but it was done in a funny, quick way so nobody bothered to be outraged... How convenient!)" 1. In the theatrical release, we have no proof of Zod's death. We merely see him, like his compatriots (Non and Ursa), fall a few feet into a mist-filled chasm. Hence, one can easily assume ( as I did when I viewed it as a child)that Zod and co. are simply falling into some kind of holding area, a notion that is supported by the international television cut (cf. 2). 2. In the international television release version, which restored scenes that were cut from the theatrical release, Zod and company are shown being led of by the police at the end of the film.